Catherine Deneuve's biography interests people all over the world. The matter is that this actress became the embodiment of the real Frenchwoman in 60-70-s of the 20th century. For her strict beauty, Catherine got the nickname of "The Snow Queen of the French Cinematography". As one colleague said about her, "Deneuve is not just a legend, she is an ideal". The photos of Catherine Deneuve decorated not only the albums of the hunters for autographs but also the billboards of Europe and North America: in the definite period of time, she was one of the main advertising models of Chanel No. 5 perfume. Deneuve got her significant roles in the following movies "The Umbrellas of Cherbourg", "The Young Girls of Rochefort" and "Indochina". The real name of the actress is Catherine Fabienne Dorléac, and later she took herself the pseudonym "Deneuve" when she began to take part in the movies. The girl was born in Paris in the family of the well-known theatrical couple of Maurice Dorléac and his spouse Renée-Jeanne Simonot. Catherine has sisters - Françoise and Sylvie and a sister Danielle from the first marriage of her mother with the actor Aimé Clariond. In spite of the fact that in the evenings her parents were clapped by thousands of Parisians, Catherine was not growing up in the bohemian atmosphere. Her mother herself was a housewife and accustomed her daughters to the housework. But it is quite natural that four girls followed in the footsteps of their parents. They acted in the movie and since childhood performed in the theater. All the daughters, except the future legend of the world cinematography. The matter was the fact that since childhood Deneuve had had an apeirophobia, that is the stage fright. The girl studied at the prestigious La Fontaine Lyceum, but already then she knew for sure that she would connect her life only with the acting career. Catherine Deneuve started her creative biography at the teenage age, the actress had her debut on the shooting stage of the picture "Les Collégiennes" when she was 14 years old. In her first movie Catherine Deneuve appeared under her real name of Catherine Dorléac, but later when her elder sister Françoise became famous in France, the girl decided that one actress with the surname Dorléac was enough for cinematography. For pseudonym, she had chosen the maiden name of her grandmother - Deneuve. The actress became famous all over the world in 1964 when the musical " The Umbrellas of Cherbourg " became the triumph of the Cannes Film Festival. It's noteworthy, that even before this she had already had roles including the leading roles, for example, in the crime drama "And Satan Calls the Turns", but these works hadn’t attracted special attention. Catherine Deneuve in the movie "The Umbrellas of Cherbourg "
Later such movies as the horror "Repulsion", the melodrama "The Young Girls of Rochefort", the comedy "The April Fools", the bright fairy tale "The Donkey Skin", the mystical picture " Mississippi Mermaid", the tragedy "Tristana" had huge success. Deneuve’s role as Séverine Serizy in the frank picture "Belle de Jour" is considered to be rather daring. It was impossible to surprise the French cinematography with the scenes with naked actresses, but the fact that the film was shot in the real functioning brothel, captured public attention. Catherine was successful throughout all her life. The Oscar-winning military drama "Indochina", the historical and social film "East-West" and the comedy "Desperate Housewife" distinguished in her filmography. Catherine Deneuve in the movie "East-West"
The actress received an interesting role in the drama "Night Wind". The actress appeared in the image of the woman called Hélène. According to the plot, Paul and Helen are distanced by the age and social position, but, despite it, they are in love with each other for a long time. As a result, the woman doesn't bear the pressure and get married to another man. Paul, trying to cope with despair, leaves to Italy. There the young man meets Serge, and their destinies turn out to be similar. Also, it's worth noting the melodrama "In the Name of My Daughter", the youth psychological movie "Standing Tall" and the underground parable "The Brand New Testament". In 2003 the audience saw their favorite actress as Marquise Isabelle de Merteuil in mini-series "Dangerous Liaisons". She played the cunning person who decided to revenge her former beloved in a sophisticated way. The novel of the same name written by the writer Choderlos de Laclos was taken as a basis of the plot. "Asterix and Obelix: God Save Britannia" and "The Brand New Testament". Very few people know that Deneuve is also a singer. The actress showed her vocal skills in the romantic comedy "I Love You All" in which in a duet with Serge Gainsbourg she sang the song "Dieu est un fumeur de Havanes", in the comedy "Belle Maman" she sang a composition of "Joyeux Anniversaire maman", and the hit of "Ho capito che ti amo" in the cover of the star sounded in the drama "The Hero of the Family". And in the detective vaudeville "8 Women" the actress also sang both solos and together with other partners, the voice of the actress can be heard in the chartbuster hit of old years - "Toi Jamais". By the way, Catherine Deneuve released songs also in the format of a full-fledged studio album. And these compositions have no relation to the movies. It is about the disc of "Souviens-toi de m'oublier" which was released in 1981. The director Roger Vadim in whose movie "Sin and Virtue" she acted, became the first love in Catherine Deneuve’s life. At that time the girl it hardly turned 17 years old, and the partner of the actress was 15 years older than she. Catherine lost the head, ran away from the house and moved to the apartment of her beloved. Deneuve gave birth to Roger’s son- Christian. After that, the director made a proposal to the mother of his child. But the girl was already disappointed in these relations and refused to him. Approximately in two years, the actress got married to the British photographer David Bailey. According to the documents, they remained husband and wife for seven years, but actually, they had lived together for no more than a year. 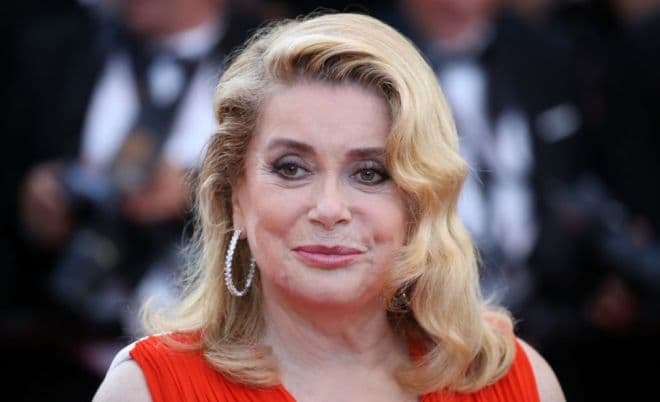 It is amusing that, remembering her only official marriage, Deneuve said that an opportunity to learn the English language was the best thing in this marriage. 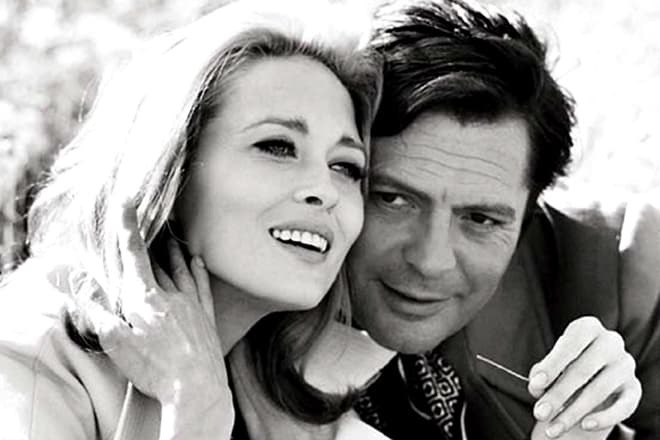 Still being Mrs. Bailey, the actress began a serious love affair with the Italian actor and director Marcello Mastroianni. Together with him, she acted in the movie "Liza" and she gave birth to his child, the daughter Chiara. Marcello, as well as Roger Vadim, wanted to see Catherine as his wife, but she again refused to her beloved and kept freedom in their relations. And in three years the woman announced Mastroianni that since then they were only friends. During next years the actress had long-term love affairs with the director François Truffaut, the actor Gérard Depardieu, and the head of Canal+ TV channel Pierre Lescure. But Deneuve stayed true to herself: she stays free, she lives in one of the luxurious districts of Paris and she herself chooses men. It’s worth saying, that Catherine Deneuve’s children had followed in the footsteps of their famous mother. Her son became the star of the drama "The Past Recaptured" and acts a lot in the theaters, and Chiara Mastroianni has numerous movies in her filmography. She is famous for her roles in the pictures "Nice Bastards" and "Making Plans for Lena". Thanks to her children the actress had already become a grandmother for six times: she has four granddaughters and two grandsons. Moreover, Catherine Deneuve visited Russia several times: in Moscow, she attended the presentation of the biographic book by Andrei Plakhov about the actress and in Vladivostok where she participated in the international Pacific Meridian Film Festival. You can find the profile with the photos of the actress in the social network of Instagram. But it is unknown whether it is an official account or a fan page. At the end of 2017 in Hollywood, there was a scandal with the participation of the producer Harvey Weinstein. Dozens of actresses accused the man of sexual harassments. As a result, the public persons extended the campaign under the name #MeToo. Catherine and about a hundred of other famous women wrote the open letter which was placed in the "Le Monde" newspaper. According to the authors, the right of the men to pick on women is a part of sexual freedom. And clumsy flirt can't be equated to the violence. Several days later the Frenchwoman apologized to the victims of sexual harassments. Her apologies were also directed to those who were indignant with Catherine's support of the rights of the men who was accused of harassment. But, despite it, the actress tolerated a different point of view. In February 2017 Deneuve appeared in the drama "The Midwife". It is the film about two women – the stepmother Béatrice and her stepdaughter Claire. Béatrice had run away from the girl and her father 30 years ago, and now she returned to ask for forgiveness and for help. In October of the same year the thriller "Everything Divides Us" with Catherine Deneuve and Diane Kruger in leading roles was released. In 2018 the actress as the central character will appear in two pictures: "Le dernier vide-grenier de Claire Darling" and "Mauvaises herbes". 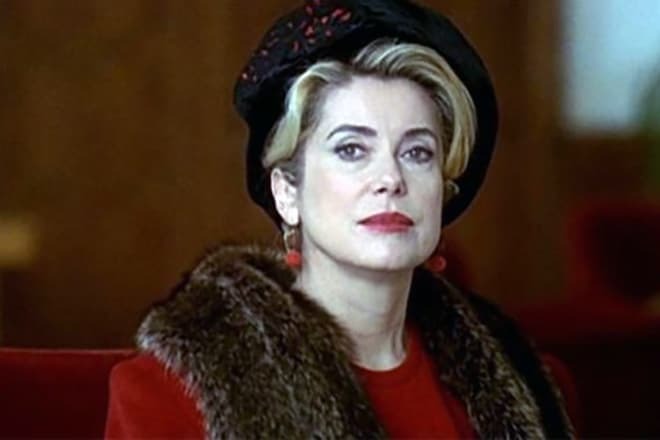 In January 2018 it became known that Deneuve would act in the new movie by the Japanese director Hirokazu Kore-eda. Juliette Binoche and Ethan Hawke will become Catherine’s colleagues on the movie stage. By the words of Juliette, the director wrote the script for these three actors. The project has no official name yet. The plot is kept in secret too. It’s known only that Catherine will play the actress, and Binoche will play a role of the daughter of scriptwriter of Deneuve. 1964 — "The Umbrellas of Cherbourg"
1967 — "Belle de Jour"
1977 — "The Forbidden Room"
2012 — "Asterix and Obelix: God Save Britannia"
2014 — "In the Name of my Daughter"
2017 — "Everything Divides Us"
2018 — "Le dernier vide-grenier de Claire Darling"